Roll, Roll, Roll Your Boat…er…Legs! As a Massage Therapist who cares about my patients recovery, I look for ways to prolong my hands-on Neuromuscular Therapy after the patient leaves my office. Using Laser Therapy helps healing through a series of chemical reactions to promote healing long after my patient leaves the office. K-Taping offers support and improves circulation and decreases neuropathic firing of nerves after my patient leaves the office. Supportive exercises also adjunct my therapy for the best recovery. However there is another modality that can help you after you leave the office, or while you wait to come in for your appointment. Foam Rollers are a great way to help between your treatments. Wikipedia describes foam rolling as a Self-Myofascial release (SMR) technique that is used by athletes and physical therapists to inhibit overactive muscles. This form of stretching utilizes the concept of autogenic inhibition to improve soft tissue extensibility, thus relaxing the muscle and allowing the activation of the antagonist muscle. This technique can be effective for many muscles, including: Gastrocnemius, Latissimus Dorsi, Piriformis, Adductors, Quadriceps, Hamstrings, Hip Flexors, Thoracic Spine (Trapezius and Rhomboids), and TFL/Iliotibial Band. It is accomplished by rolling the foam roller under each muscle group until a tender area is found, and maintaining pressure on the tender area for 30-60 seconds. “If you spend enough time at a gym or log enough miles running, you’re probably familiar with the roller. And you likely have a love/hate relationship with it. For everyone else, the roller looks like the type of object that could easily be confused with leftover material from shop class. Or, when standing upright, a budget plinth. 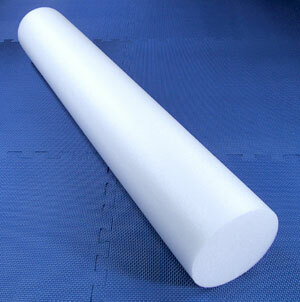 Made from extruded polyethylene foam packed into a dense cylindrical shape, it provides a straightforward, risk-free way to calm overactive muscles as a form of soft tissue therapy (also known as myofascial release). But be warned, it can feel excruciating. The foam roller does not give you license to speed through the pain. Roll slowly and work through the squirmy spots. Spend between 30 and 60 seconds on each exercise. There’s hardly any strategy involved in rolling. The only constant: placing the roller under the target area. For lower body exercises, you use your arms as levers to rock you back and forth over top the tube. You rock, it rolls! A lot of the movements are intuitive. Using the IT band as an example, lie on your side with the roller under your thigh, bottom leg raised slightly above the floor. Cross the other leg over as an anchor (hands on the ground too) and begin. Just make sure to never roll down as far as the knee (or other joints). When in doubt, ask a trainer at the gym to correct your form, or look on YouTube. I typed in foam roller and found more than 600 videos, all addressing the basics as well as postural and core training exercises. Indeed, rollers can be an excellent complement to Pilates. Try a traditional bridge with the roller under the sacrum, or attempt a plank with the roller propped under the ankles and you’ll understand immediately. When you lie vertically along the roller (so it’s parallel with the spine), you can lift your legs, carefully, to 90 degrees and presto, the core starts working even harder. Melissa Enfield, a Toronto-based yoga and Pilates trainer, devotes some classes entirely to roller work. She says everyone can benefit from using rollers but they are most helpful to those who are generally in good shape but have an injury that needs to be addressed, as well as anyone trying to improve mobility and range of motion. She also likes that the extra balancing necessary to stay atop the roller translates into “intrinsic core muscle activation” (deeper engagement). The roller is effective, she explains, because the pressure turns on the Golgi tendon organs, sensory receptors connected to the muscle fibres, and causes them to relax. For people who find the sensation too intense, Ms. Enfield recommends wrapping a towel around the roller or, as a last resort, trying a softer tube such as a pool noodle. If there’s any downside, it’s that the standard size (36 inches) is large. But half-size rollers are available. Over time, rollers can lose their rigidity and will need to be replaced, so watch for flattened areas. Prices range typically between $18 and $40, depending on length and density. I personally use the TravelRoller, both in my own home gym in the office. It also comes with three pressure balls, excellent for finding those pesky Trigger Point, like when to just need somebody to push a thumb into that spot. Just some reminders however when using the rollers. 2) Make sure it is NOT painful, especially if you are doing it before a lifting session. Remember pain decreases performance. 3) Find a trainer/therapist that uses non painful hands on work combined with active mobility work. 4) Ask your therapist when in doubt. That’s all for now. Try the roller. It may just replace me … Nah!